Come playoff time, every team is hoping their regular-season slate has left them better. But with the postseason typically comes a string of unfamiliar opponents, making it difficult to precisely gauge the improvement. 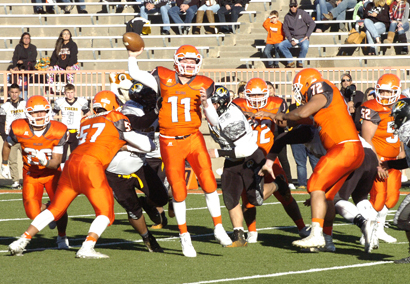 The Bulldogs, however, got to see the fruits of their labor in living color Saturday at Bulldog Bowl as they defeated an Alamogordo squad they’d topped 48-35 Oct. 7 in Alamo by a 27-point margin in the Class 5A quarterfinal round, 56-29. “We’re really pleased, to say the least,” head coach Rex Henderson said Saturday. “When you’re playing somebody you’ve already played, to come out and do as well as we did and be able to do things better than we did the time before is a credit to our staff and the work they’ve done, and our athletes and the work they’ve put in during that time. The ‘Dogs overcame a few first-half glitches that saw them leading by just a touchdown, 21-14, at halftime to dominate the final quarters, scoring to cap all but one of their six second-half drives while forcing three Tiger punts and a pair of turnovers. 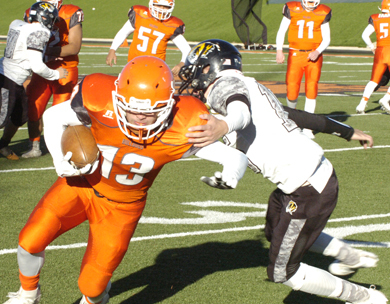 Artesia couldn’t have scripted a better start to the contest at sunny but chilly Bulldog Bowl. The Big Orange offense marched 70 yards on nine plays to kick things off, storming Tiger territory on a 45-yard catch-and-run from Taylor Null to Robert Fernandez before scoring on second down from the one on a toss from Null to David Barlow. After the Orange Crush followed with a quick three and out, the momentum was firmly on the Bulldogs’ side. 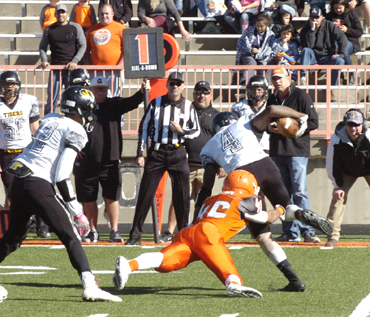 But Alamo was able to find their feet after a fumbled punt at the Artesia 22-yard line, scoring on an 11-yard pass from Kyle Hooper to Chamar Norman to tie the game with 5:32 to go in the first. The ‘Dogs would score again before quarter’s end, however, as Null involved five different receivers in between runs by Ryan Gallegos and Fernandez en route back to the one. From there, the QB hit Chaney Hardt at the goal line to put Artesia back up 14-7 going into the second. 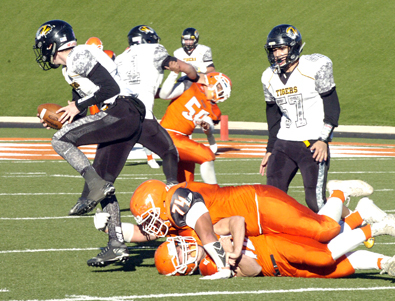 Alamogordo moved efficiently to a first and goal at the Bulldog five on their ensuing possession, but after consecutive sacks of Hooper by Colin Flood and Jharyss Granger, it looked as though the D might keep the Tigers out of the end zone on third and 18. But Hooper connected with David Johnson to reinstate the deadlock with 7:13 remaining in the half. 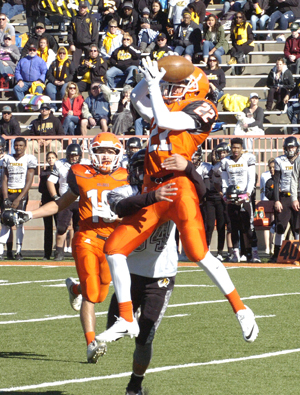 Artesia needed just 21 seconds to craft their response, and it was a word with a bark on it as Null launched a 53-yard bomb to Dominic Madrid, who snagged the pass over his shoulder at the Tiger 12. Fernandez would take it in from there to set the intermission tally, 21-14, as the two teams traded punts before time ran out on Alamogordo’s final drive of the quarter. The Tigers came out driving to start the second half, but the Crush notched the big play they’d been looking for on first down at midfield as Tanner Harris picked a Hooper pass at the Artesia 37. The ‘Dogs’ brutal backfield of Isaiah Weideman, Fernandez and Ryan Gallegos would cover the 63 yards in seven plays, culminating in an eight-yard sprint up the gut by Weideman at the 9:24 mark that gave the Bulldogs some breathing room, 28-14. And from there, Artesia would make the third quarter their own. In between three-and-outs served up by the defense, the ‘Dogs delivered two quick scoring drives from midfield, ending in runs of one and six yards respectively by Gallegos. 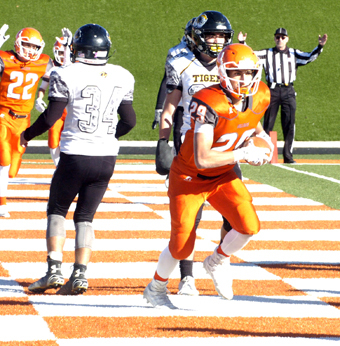 That put Artesia up 42-14 with three minutes left in the third, and with the Tigers’ final series of the third also ending in a punt, the picture was decidedly bleak for Alamo. 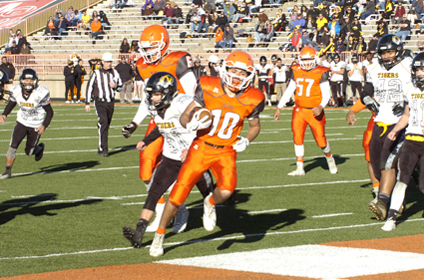 The Bulldogs spotted the Tigers favorable field position to start the fourth, however, on a fumble at the Alamogordo 41, and Hooper was able to cap the drive with a 10-yard TD run on fourth and seven. 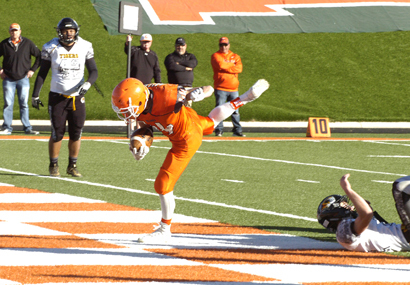 Artesia’s next score was essentially the back-breaker, a four-yard end around by Kameron Aguilar that made it 49-21 with six minutes to go. But to the Tigers’ credit, they refused to throw in the towel, scoring again on a 13-yard pass from Hooper to Hayz Hill to pull back within 20 at the 4:36 mark. A 12-yard run by JR Bustamonte, 16-yard pass from Null to Barlow, and 16-yard touchdown run by Fernandez, who cruised untouched into the corner of the end zone, would set the final with 3:58 on the clock, however, as Chase Thompson thwarted Alamogordo’s final possession with a leaping pick. The Bulldogs finished with 548 yards of offense to Alamo’s 313, 314 passing and 234 rushing. Null was 21 of 37 for 304 yards and two touchdowns, while Fernandez led the ground attack with eight carries for 77 yards, followed by Weideman (6-57), Bustamonte (4-54) and Gallegos (7-29). Madrid was 2-61 receiving, Hardt 5-48 and Gallegos 2-42. The workhorse senior Hooper completed 19 of 38 passes for the Tigers for 212 yards and three scores and also led Alamo in rushing with 18 carries for 73 yards. “I was particularly pleased with our defensive effort today,” said Henderson. “I thought we really did a good job of getting after their quarterback and making it hard for him to settle in and throw. With the exception of some turnovers, we mostly held a pretty good offense in check. With the win, the ‘Dogs improve to 9-2 on the season as they prepare to host another familiar foe: the Los Lunas Tigers. “We knew going into this year that the 5A teams on our schedule were going to be some of the better teams,” Henderson said of the unusual prospect of, should Artesia and Roswell High both win this weekend, all three playoff games being rematches. But Artesia is by no means looking past their second set of Tigers. No. 5 Los Lunas edged out No. 4 Belen 16-14 Friday after walloping No. 12 Kirtland Central 60-10 in the first round and will be riding high at 1 p.m. Saturday when they head into Bulldog Bowl. Class 5A’s other semifinal will play out at 7 p.m. Friday, Nov. 25, in Albuquerque as No. 3 Roswell takes on No. 2 St. Pius. The Coyotes routed No. 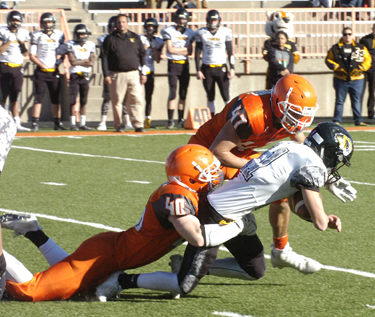 6 Miyamura 44-6 in the quarterfinals, while St. Pius held off No. 10 Farmington 41-32.